Jerry Entin contributed these photos of this interesting little car. "So far the drivers that I have been able to locate for the Ted Corazza Riviera Cooper-Porsche, #40, are Clarence Raville, Ed Barker, and Scooter Patrick. I also have a second photo, shot by Bob Tronolone, that shows the car later at Pomona after Scooter crashed the car at Santa Barbara. Eddie Barker was back behind the wheel. The bodywork was changed slightly and was not quite as nice. Apparently a racer, I think his name was John Fox, imported two or three streamlined Cooper Formula 500 cars and ran two of them at Bonneville. One car became Pete Lovely's famous Pooper. Another is Ted Corazza's car. After Fox sold the cars the Porsche conversions occured. 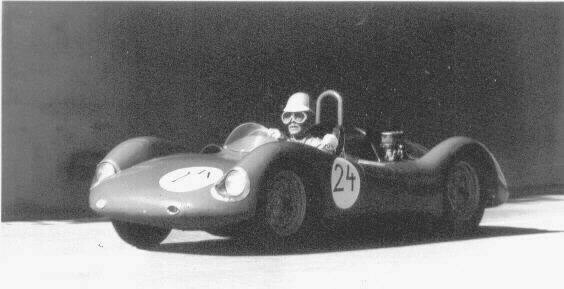 I actually saw the Corazza car in 1964 all restored with the Porsche motor replaced with a Sprite motor. However it still had the Porsche wheels and brakes." Details of the car's bodywork. Very nicely shaped to closely follow the Porsche engine's contours. "Pomona, November, 1958... 41 laps... Under 2000cc... 15 cars finished and #24, the "Pooper" DNF'd with Ed Barker driving, reason unknown. 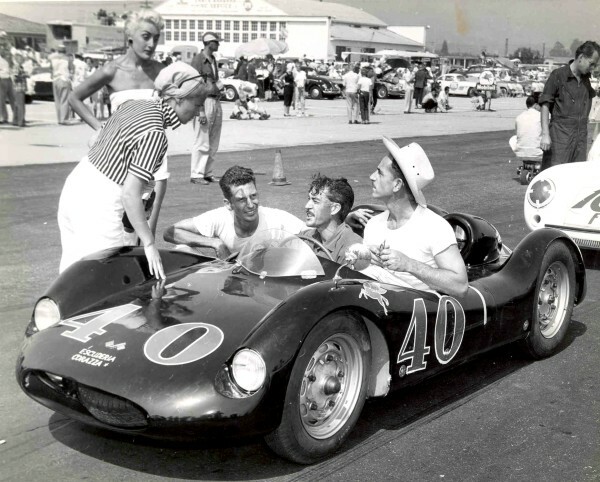 But the year before at Santa Barbara in September, 1957 the car ran as #40 in black color entered as a "Porsche- Cooper" by T.R. Corazza with Ed Barker as driver." "Scooter did not wreck the car. He did bend the first PAM special at Santa Barbara causing my confusion. The car did get bent but I do not know when or by whom. Hans Adam did drive the car. 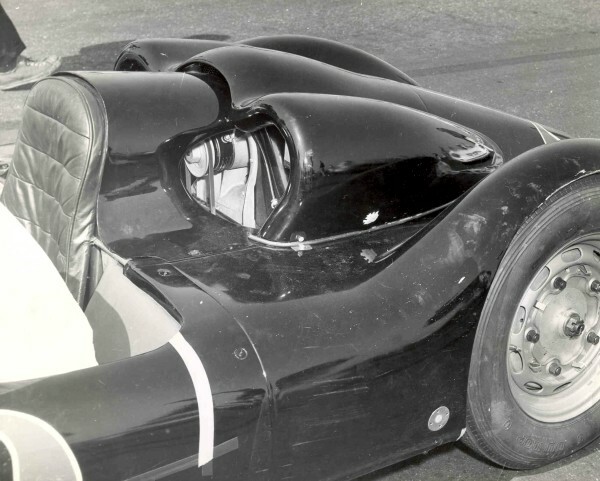 The car always raced with a 4-cam motor, not a push-rod unit." "My name is Steve Gough and I came across the pictures of this car on your website. I have forwarded them on to my Father in Law as he was related to Clarence and I hope he can give more details. My wife remembers him well, he was her Uncle, and she grew up around him and his family. I met Clarence a few years ago just before he passed away. Dan Gurney offered him the test driver role in Europe but he declined it as he didn’t want to move his family out of the US. As well as being a race car driver he was a tinkerer extraordinaire and a prolific inventor who held many patents, particularly those related to firearms. He invented a safety for the 1911 type pistol that is now standard on every one produced. As good at inventing as he was he was just as bad at business and lost all he had several times over, he would recover only to have it all disappear again. He had some very bad family trouble in recent years and it took its toll. If I discover any new information I will be sure to pass it along." Next: George Keck -- Porsche "RSKeck"